The Church of Jesus Christ and Latter-day Saints is the foundation for this coming-of-age musical that is packed with outrageous delight and gential jokes. It’s basically everything you’d want from a comedy. Even if you’re not a musical fan, I would recommennd this. Leave your expectations at the door and go in with an open mind, because this musical will have you clutching your stomach with the pain of laughing. As someone who hasn’t prayed to God in a few years, I found myself feeling reborn after seeing this musical. It’s a new favourite. And here’s why. Written by South Park creators Trey Parker and Matt Stone, The Book of Mormon tells the story of two young, clean-cut Mormons who have just finished being trained and are sent out to spread the word of God. Elder Price and Elder Cunningham (fantastic international leads Ryan Bondy and AJ Holmes respectively) couldn’t be farther from the opposite of each other, yet they’re paired together to travel to Uganda as missionaries. Elder Price is the poster child for an overachieving teacher’s pet, extremely devoted to the cause; in contrast, Elder Cunningham is an overly imaginative dork who struggles with telling the truth. Their partnership sets up the premise to comment on the Mormon church (‘Hello’), the politics of gender and colonialism (seen in the songs ‘All-American Prophet’, ‘Man Up’ and ‘We Are Africa’) and what does it mean to believe in something differnet to other people. The Book of Mormon doesn’t shy from portraying sexual and racial politics, yet it’s very quick to indicate its self-awareness and create self-deprecating moments to earn your laughter. One of the best moments is Elder Price and Elder Cunningham arriving to Uganda under the impression the town is much like The Lion King and Hakuna Matata is just like ‘Hasa Diga Ebowai’ (which is roughly translated to a big ol’ middle finger to Heavenly Father). The shock of famine, poverty and STIs breaks this fantasy for the two young missionaries, and reminds the audience the musical’s commentary, while comedic, is thought-provoking and a bit too real at times. Act 1 is somewhat flat and scattered in its comedy, yet is redeemed with ‘Man Up’, which nails the ending of the naviety of our two missionaries and changes the course of their journey. However, Act 2 is a hoot. 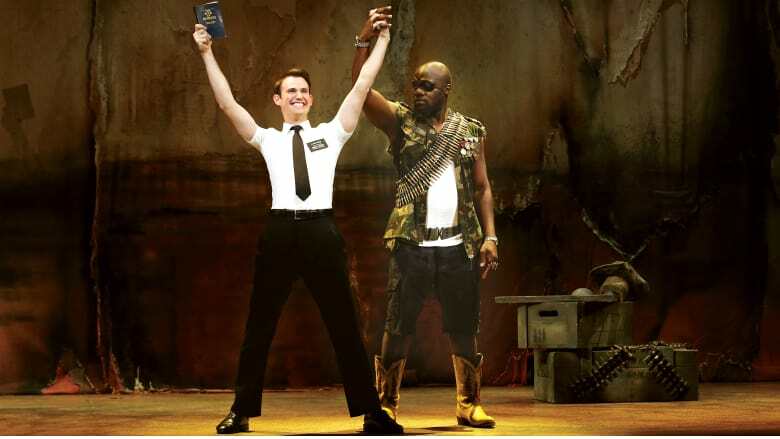 With tracks that showcase the Mormon version of hell with Lucifer shredding an electric guitar accompanied by some gruesome historical figures (‘Spooky Mormon Hell Dream’), and the people of the Ugandan town being baptised (‘Baptize Me’), the conviction of the Mormon boys is charming and staged to heighten the comedic value of the show right up to the last song. I also started dancing in my seat, so that says something. Ryan Bondy as Elder Price and Augustin Aziz Tchantcho as the General. Source: Jeff Busby. If you know anything about South Park, you’ll understand why certain jabs and jokes are shockingly hilarious, black, witty and visercal. What’s quite good about The Book of Mormon is the avoidance of taking shots at certain aspects of Mormonism such as the significance of their underwear and polygamy, yet it doesn’t stray from scripting an entire song – ‘All-American Prophet’ – detailing the origins of the religion where the blond-haired blue-eyed voice of God came down to Joseph Smith. 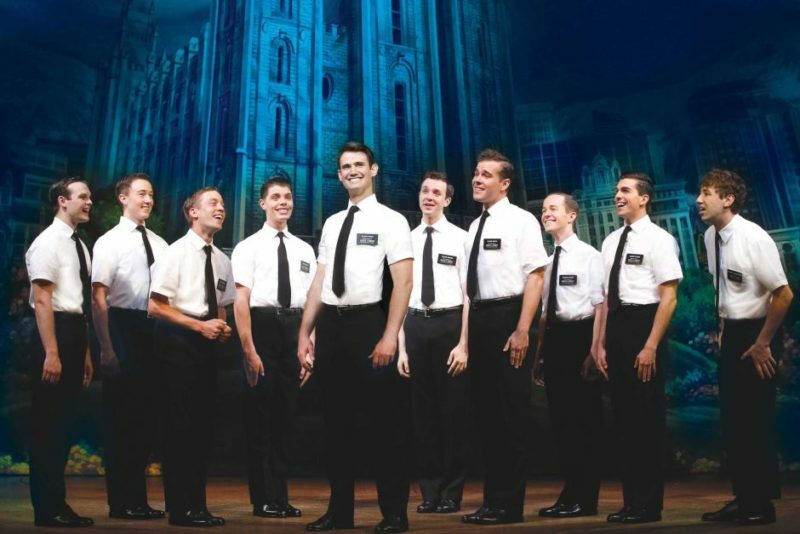 The premise of the musical taking the mickey out of Mormonism has sparked Australian Mormons to come out and set the record straight. At the end of the day, that is what it is: a satire. If anything, it paints a tale of standing firm for what you believe in and going out of your way to help others, alongside crude jokes. From spooky Mormon hell dreams to baptisms to confronting a general whose name is literally General Buttfuckingnaked, this musical is a worthy experience. I can guarantee you’ll be singing the songs all the way home. Don’t think too much about the religious side of it because this is a spiritual experience that has nothing to do with God. The Book of Mormon is being shown at the Sydney Lyric Theatre until late July.